Every year I get questions from new homeowners and victims of chemical lawn care companies about what can be done to decontaminate their properties. Here's an update on the detox program. If your soil has been contaminated with heavy metals like arsenic and chromium in treated lumber or creosote in railroad ties, or with lead and arsenic from iron supplements, or if the contamination is from toxic pesticides like permethrin, MSMA, 2,4-D, Roundup, Sevin or petroleum spills, the solution is the same. No, digging the soil out and hauling it off is not the answer. That just moves the problem from point A to point B. First, stop the contamination if it continues in any way. The violators need to be put on notice that they are responsible for the contamination and damage. Second, apply fine textured humates or activated charcoal. Fine textured zeolite can be mixed with the carbon products or applied separately. The rates of both products should be at least 20 lbs. per 1000 sq. ft. The next step is to spray all the foliage and drench the soil in the problem area with Garrett Juice with orange oil (D-Limonene) added at 2 ounces per gallon of mix. The carbon products (humates, compost tea and charcoal) will tie up the contaminants; Garrett Juice and orange oil stimulate the microbes to feed on and breakdown the toxic molecules. Liquid molasses is in the Garrett Juice mix but adding additional molasses to the Garrett Juice mixture will help speed up the decontamination process. Adding a beneficial microbe product will speed up the process even more. P.S. Here is an overview about Organic Gardening. Q: Should plants be removed (asparagus) before treating with the soil detox. P.D., Grandbury. A: No - the liquids in my detox program function as excellent root stimulators. A: The best product for cleaning the soil is Biogize-SD, an activated charcoal product. Zeolite is the second-best. Follow the label directions for Biogize or hire an organic landscape contractor to apply it. Digging the soil out and hauling it off is not the answer. That just moves the problem from point A to point B. If your soil has been contaminated from pesticides or petroleum spills, is contaminated with heavy metals like arsenic and chromium in treated lumber or creosote in railroad ties, or with lead and arsenic from iron supplements, the solution is basically the same. Second, apply the activated charcoal product Biogize-SD. It’s very fine-textured and must be mixed with water to apply. Fine textured humates are the next best choice. Zeolite can be applied in a granular form if the budget allows. The next step is to spray and/or drench the problem area with the Garrett Juice solution plus orange oil or D-Limonene at 2 ounces per gallon of mix. Activated charcoal will tie up the contaminants; Garrett Juice and D-Limonene stimulate the microbes to feed on and breakdown the toxins. Liquid molasses is in the Garrett Juice mix but adding additional molasses to the Garrett Juice mixture will greatly help the decontamination process. Adding the microbe product called Bio S.I. will speed up the process. 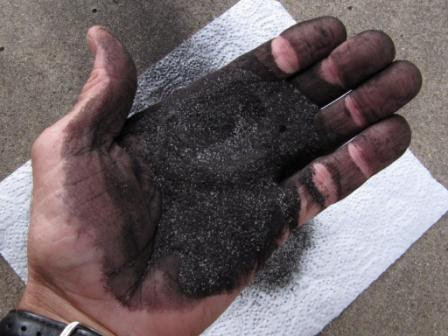 Activated charcoal is widely used to decontaminate soils from a host of toxic compounds. The North Carolina Cooperative Extension Service states in Using Activated Charcoal to Inactivate Agricultural Chemical Spills: “Activated charcoal is the universal adsorbing material for most pesticides.” Many golf courses use activated charcoal just for those unforeseen emergencies when fertilizers, pesticides, herbicides, insecticides, miticides and other disease control products are overused. Many agricultural growers use activated charcoal to decontaminate soils after heavy spraying of pesticides and fungicides, prior to reseeding. And many gardeners and homeowners use charcoal for localized soil contamination.